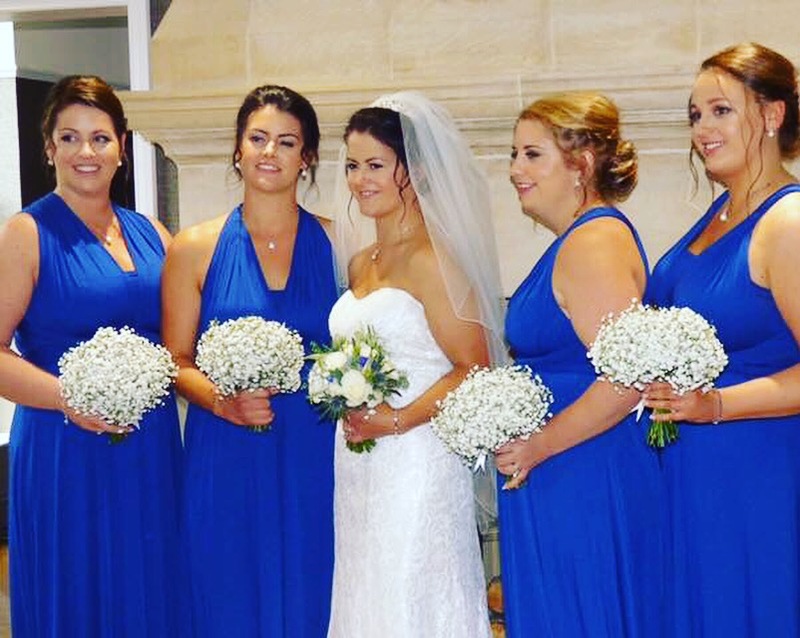 With the role of being a bridesmaid can come many different tasks – helping the bride pick her dress, organising the hen-do or even being asked to help with the decorations. This is where local blogger The Harrogate Girl, aka Vix Turner, found herself last year. Here she tells us how she solved her decorating conundrum! 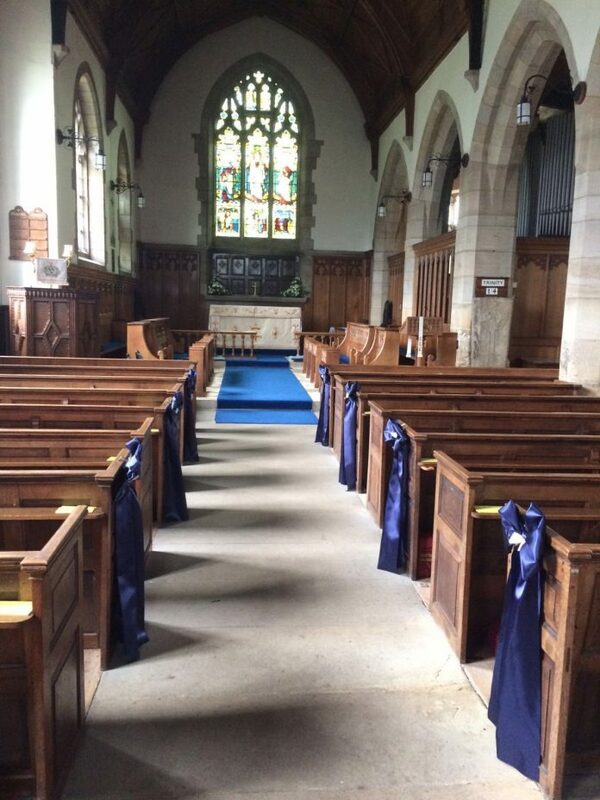 ‘As part of my bridesmaid duties I was tasked with making something pretty to sit at the end of each church pew. So I did what any girl would do and got on to Pinterest! Having an idea in mind and more importantly measured the length of the pews I went along to The Cone Exchange. Ribbon in every colour imaginable faced me. It was like I’d stepped into a rainbow. After browsing a little and getting distracted by the gorgeous fabrics I came across a beautiful blue silky ribbon – it was perfect. I also found some lovely cream lace ribbon and pearls. 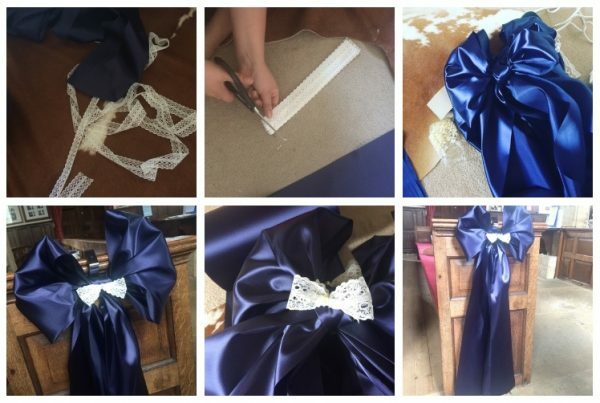 Using your measurements consider how much length you’d need to tie the bow and cut the fabric (with enough overhang to do the final cut when the bows are in position. Tie each bow. You can faff with them when they are finally in position but you will need to ensure the bow is almost perfect. Cut 20cm long pieces of lace ribbon eight times. To make a bow take each end of the lace ribbon fold into the middle (10cm in), pinch the middle to create a bow shape. To secure this, sow in place and attach a single pearl in the centre. Stich the lace bow onto the centre of the blue bow.